Happy Birthday from Chai and Wally! Aww! Glad you had a great day! Happy Birthday, shewolf! Your daughter is cute when she is happy for her mom. Late as usual...sounds like it was a great day though! Belated best wishes. So sorry I could not honor you with having my baby yesterday. Can I have another birthday? oh yeah, thanks Wally, I always forget all that birthday crap. Late here also. Glad is was such a great day, shewolf. Had-tee bird-day to mama Had-tee bird-day to mama. Better late than never. Happy belated Birthday! Have a howling good birthday today! 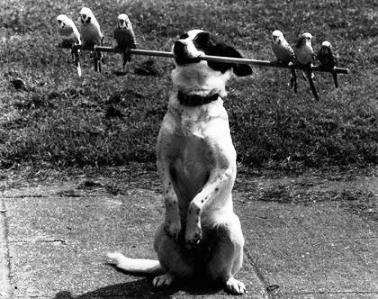 Here is a picture of a bird dog for you, just in case you don't have one. you guys are sweet . i completely missed this thread . thank you !